Carol Ann Smith knew she wanted to touch the lives of others when she obtained her nursing degree from St. Scholastica in 1978. Thirty-five years later, she has been acknowledged for the countless lives she has affected with her compassion and dedication as a professional who has advanced the understanding and support of traumatic brain injuries in patients and their families. Last spring Smith was awarded the Elinor D. Hands Outstanding Achievement Award at the Minnesota Brain Injury Alliance's 28th Annual Conference. "This is my career, but it's also my life," Smith said. "It's much more than my job; it's who I am and what I do, and I'm very passionate that our patients can get the best care that they can and getting them hooked up with services." Smith exemplifies the spirit of a trailblazer. She has been employed at Hennepin County Medical Center in Minneapolis for the duration of her career and has held multiple neuroscience nursing roles that have required her to be a mentor, educator and counselor to hundreds of patients and their families. Her job calls for her to counsel families on whether their loved ones will survive their injuries or not, and if so, what they should expect for care and rehabilitation. This has required a devotion to coordinating the best possible care for her patients and their families. Executive Director David King of the Minnesota Brain Injury Alliance described Smith's innate ability when presenting her with the award. "Whether they were a critically injured patient ... or the numerous professionals whom she has mentored along their own journey, Carol Ann has left her own stamp on the hearts and souls of each one of them," King said. 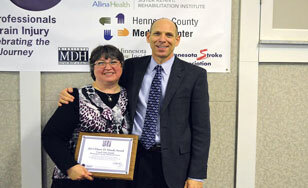 In 2006, HCMC opened a dedicated traumatic brain injury center. Smith was selected as the program coordinator and has been since working in that role. The center is No. 1 in the state for admitting brain injuries and admitted 998 patients last year alone. After being appointed by the commissioner of the Department of Human Services, Smith earlier this year finished serving the maximum of two three-year terms on the Minnesota Traumatic Brain Injury Advisory Committee, where she discussed brain injury awareness and prevention in legislation. She lobbied for the passage of child restraint laws and hockey regulation. She uses her passion to give presentations locally, regionally and national on traumatic brain injury and in her role of providing community outreach. She uses a "brain bar" booth to teach the public on brain injury and how to prevent one. Smith said taking simple precautions like wearing a bike helmet, a seat belt and being careful on a ladder are little ways you can lower your risk of brain injury. It's evident that Smith is in a role that allows her to do what she set out to do, and has done - touch the lives of other people. "I love what I do," she said. "I want to do the work that I'm doing; it's really a part of my heart."